Tonight, I present you with ideal winter comfort food. It’s warm, creamy, “cheesy,” and filling, and it’s easy to prepare. 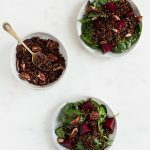 If you cook your quinoa ahead of time (perhaps as part of a weekend batch cooking routine), then you can even throw this together on weeknight, after work or class. The leftovers get better over the course of a day or two, and they’ll also freeze for a couple of weeks, so no matter how many people inhabit your home, it’s worth making the whole recipe and saving leftovers for a quick and easy express meal later on. And did I mention that it’s cheesy? In his recent roundup of vegan favorites, my boyfriend mentioned that I put nutritional yeast on everything. Guilty as charged. I add nooch to grain bowls, salads, curries, and…everything. But the real beauty of nutritional yeast isn’t only its value as a condiment. It’s also the perfect base for creamy, “cheesy” vegan sauces. 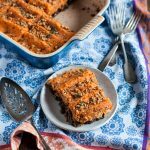 In this recipe, I’ve used the classic cashew/nutritional yeast combination, along with cooked chickpeas, which add a thick texture (not to mention a healthy dose of protein, folate, and iron!). The sauce is excellent, and it may now join my steady rotation of creamy condiments. The broccoli in this casserole is lovely, but you could swap it for all sorts of green veggies: kale, spinach, green beans, peas, shredded Brussels sprouts…I could go on. Like many casserole dishes, this one lends itself to customization, based on what you have at home. It’s also a nice vehicle for frozen vegetables, if you’re short on groceries and looking to make something special. Fill a medium sized pot with water and fit with a steamer attachment. Bring the water to a boil and steam the broccoli florets until crisp-tender (about 3-4 minutes). Remove them from heat. Blend all of the sauce ingredients together in a high speed blender or a food processor until they're totally smooth. Preheat your oven to 350F. Heat the olive oil in a large skillet over medium heat. Add the onions and celery, and sauté the vegetables until the onion is clear and soft (about 7 minutes). Add the quinoa and the broccoli to the skillet. Add the sauce and stir everything to heat it through. Transfer all ingredients to an oiled 7x11 or 8x12 baking dish. Top with breadcrumbs, if using. Bake for 30-35 minutes, or until the casserole is bubbling gently and the breadcrumbs are golden. Allow to cool for 15-20 minutes before cutting into squares and serving. 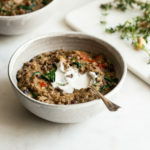 As I’ve mentioned a few times recently, I’ve been in a bit of a recipe development rut, relying often on bowls or old, tried-and-true meals to get by. When I made this bake last week, I had that sweet sense of personal accomplishment that comes when one has created a really satisfying meal. It had been a while, but it was enough to make me feel inspired again. Cooking is funny; it’s easy to fall into ruts or to lose one’s sense of creativity, but even one good meal is usually enough to get the wheels turning again. I hope to have more to share soon, and in the meantime, I hope you’ll enjoy this dish as much as Steven and I did. Ooooh, I’m such a sucker for a cheesy bake! And I totally get the nooch on everything situation – love that stuff! Definitely keeping this one up my sleeve to try very soon. I’ve got a good friend who is both gluten and lactose intolerant, so this is perfect for her. This honestly looks like my next obsession! I am excited by this recipe. My husband is not vegan and for a treat, once in a while, I make him that nasty broccoli casserole that includes eggs, mayo, and Campbell’s soup. This looks like an option he just might like and I will love it. What’s not to love about broccoli, quinoa, and nooch all in the same recipe!!! Looks delicious! 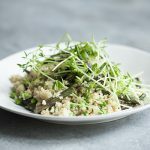 I’m going to replace the quinoa with brown rice when I try this recipe, I’m sure the results will be fabulous. I’m totally guilty of this too, nooch on everything! I love a good cheesy broccoli bake, so this is going into the meal plan rotation for next week : ) Also, I’ve made your queso sauce a million times and just inhale it EVERY time! This is like magic! Omg so so so good! I have a nut allergic little girl. Any suggested replacements for the cashews? Hemp? I’d say hemp seeds (shelled) or sunflower seeds (soaked). Or 1/2 cup silken tofu would work well, too! I hope your daughter loves it. Incredible Gena! This one is sure to be a favorite in my household! I too am a nutritional yeast addict 😉 Thanks for sharing! I don’t use nutritional yeast, any suggestions? Oooh — that’s tough. This is one of the recipes where nutritional yeast really does play a pivotal role in the flavor. I’d honestly just omit and maybe add more flavor to the sauce with extra lemon, miso, and/or salt. It’ll still have a lovely creamy texture, just not as much “cheesy” flavor. I hope you enjoy it! Gleening from nacho kale chips I’ve been super successful with getting an amazing”cheese” flavor with sunflower seeds, carrot, lemon juice, and a splash of apple cider vinegar and a dash of Celtic sea salt. I throw it all in the vitamix. Just add ice water and puree to desired consistency. For kale chips I add garlic, onion, spices, and magic pepper (a mix of peppers we collect, dehydrate, and pulse to powder for use instead of black pepper). Aaaand this is going straight onto my list of blogger recipes to -actually- try – not just pin – this year. I’m basically obsessed with nutritional yeast and the combination with broccoli, cashews and quinoa sounds fantastic. I spice my vegan cheese sauces similarly – smoked paprika is a must! – so I can already tell this will be delicious. One question, though: Does the miso add a lot in terms of flavour? It’s really hard to get around here and I know I wouldn’t be using it a lot so unless you think it’s neccessary I’d rather skip it. You can omit the miso for sure. I think it lends both saltiness and umami to food, which is why I really enjoy it as an ingredient. But you can easily add the saltiness by adding more sea salt if you don’t think you’d utilize the ingredient very much. Enjoy the recipe! Thank you Gena, I’ll let you know! Oh… I’m making this next week! Wowzers. Reminds me of a pre-vegan day meal I used to make, but sounds so. much. better. I especially like the chickpeas in the cashew cheeze. Howdy! I find this delicious and interesting… I thought raw vegans did not cook their food over a certain temperature? i did the Fully Raw Kristina challenge last month and none of her food is cooked. It was kinda rough at first, but really hard not to want to cook food. Cheesiness and broccoli? Ummmm YES PLEASE! Broccoli and cheese casseroles used to be one of my favorite things when I was a kid, but this seems like a much more nutritious option! I love the idea of using quinoa instead of rice (like so many other casseroles!) I bet this would be great made into a burrito the next day with some kale leaves! I made this last night! It was FAB. I did the Gena recommend of silken tofu instead of cashews and baked it in an 8×8 and did slightly less of all ingredients. Thanks Gena!!!! I loved the addition of chickpeas as well…chickpeas in everything, always! So happy you liked it! I definitely want to try the silken tofu variety. I made this yesterday and it was a great success. Delicious. I would like to try it again with rice. Although quinoa is my favourite, I think our non vegan family members might be tempted swing over to a more vegan diet with rice. So happy you liked it, Audrey! I’m eager to try it with brown rice myself. I made this last night. When I told my carnivore husband what it was and that he should try some, he said he’d just try a bite off my plate. He took a bite, took my plate, finished it, and had seconds. Success! The entire dish was delicious, and I’m already deciding what other dishes I will use the cheesy sauce on. Wow. Loved it. Can’t wait to discover what you come up with next, Gena! I’ve made this twice already! YUM! I used macs instead of cashews (allergy) and used a mix of quinoa and rice because my girl turns her nose up at quinoa. This one is a keeper. Thank you Gena! What beautiful, healthy comfort food! 😀 I’m going to have to try this as soon as I can get my hands on some decent broccoli. I LOVE “cheesy” sauces and sauces made with chickpeas! So I prepped this last night and planning to bake and serve tonight. The sauce was delicious when I tasted a spoonful, but once mixed it in, I couldn’t even taste it. I followed the amounts almost exactly. Will the flavor get baked in or does it need more sauce? (I don’t really have time or all of the ingredients left to make more sauce!) Thanks! Don’t worry, I think you’ll find that the flavors are brought out by the cooking process. If you’re nervous right now, try an extra pinch salt in the unbaked casserole, but I’d stick it in the oven and trust that it’ll be very flavorful when it emerges. Hope you love it! I made this topped with cornmeal and it was amazing. I then blended the leftover chickpeas/quinoa with some curry/turmeric roasted cauliflower and garlic cloves and coconut milk into a soup to stretch the ingredients and meal prep a little further. Thank you for a great recipe! It would be great if you could clarify in your recipes in the future! Can’t wait to share this with my vegan boyfriend later this week! Thanks Maya. I do recall this distinction from cookbook writing, and updated accordingly. Thanks so much for this recipe! I’ve made it 4 or 5 times now with only the addition of sliced mushrooms (I add mushrooms to everything, can’t help it). Such a great recipe, it will definitely stay in the rotation. My daughter, who does not believe on vegan cooking, tasted the dish, right away wanted the recipe……..I could not believe it! It’s a great dish, Thank You! Do you want me to use one cup of cooked chick peas or do you want me to take one cup of chick peas and cook them? I am honestly unsure, but I am about 70-30 leaning toward one cup of cooked chick peas — even though that is not what you wrote. Looks wonderful. Can I leave out the miso? Or, what can I sub? You can definitely leave out the miso, Rosario. A lot of what it contributes is saltiness, so you could add a pinch of extra salt if needed–just use your taste buds to judge. Can this be frozen? Sorry for asking this question often, but I have a serious preference for recipes that can be frozen! Yep, this can be frozen for up to 4 weeks. Great! It’s on my list of next recipes to try asap then! Hey Gena, I made this bake yesterday and reheated individual portions less than a minute in the microwave as part of our dinners tonight. Unfortunately, it was rather dry and the delicious flavour of the vegan cheese sauce (that I tasted on its own when I made it yesterday) was quite faint, leaving it lacking in flavour overall. Since we will be eating it again, what do you suggest? Should I make more cheese sauce (maybe half or a quarter of the full recipe) and pour a few spoonfuls on the individual portions when I warm them up? Or will that create the opposite problem and make it too runny (I recall the cheese sauce being very runny on its own)? Is there a way I could prepare the cheese sauce and have it be less runny maybe? Look forward to knowing your suggestion(s)! Sorry, another question: what drew me to this recipe is its resemblance to my mom’s broccoli casserole with mushroom cheese sauce (non vegan and with terrible processed ingredients like Cheez Whiz, but the taste is amazing). I think this bake would be even better with the addition of mushrooms. If I make more sauce to pour over the remaining bake, could I sautée some mushrooms and maybe pour the sauce in the pan with them and then pour the combo over the bake? I think the idea of mushrooms and extra sauce is great. Otherwise, you can do the sauce over reheated portions on its own, but if you’re worried it will be too runny, you can simply decrease the water you use when you blend the sauce. Hi Gena, last question I hope: how long does this keep in the fridge? I know you said I can freeze the rest, which is great. Up to four days should be absolutely fine, and you may find they keep for a whole five (use your judgment, of course). This looks perfectly lovely! Your thoughts on what might be substituted for the smoked paprika? We have a family member who cannot tolerate anything capsicum, dried or fresh . . . Many thanks. Looks good, but I’m just wondering about “fill a medium sized pot with water and fit with a steamer attachment” part. What if I don’t have a steamer attachment? Can I still make this recipe? Most definitely. You can actually use a strainer instead of a steamer attachment (using the lid of the pot to cover it) or you can boil the florets until they’re crisp tender (about 3 minutes) and the drain before using. My family and I love this recipe! It’s a favorite of my daughter’s and she’s one of the pickiest eaters I know!